FEATURED TEACHERS, PROFESSORS AND HISTORIANS - Place to discover the stories that illustrates the dreams, troubles, goals and passions of the Asian Pacific American communities! Cartoonists, Painters, Architects, Sculptors, Jewelers, etc. RICHARD AOKI - prominent community activist who is the field marshal for the Black Panther Party, Third World Liberation Front leader, professor, etc and started his protests in the 1960's. LU-SHENG CHONG - director of the Chinese Cultural Learning Center. He has introduced Chinese culture to Americans. He has devoted his life and strength at teaching, publishing and operating Chinese cultural centerS for more than forty years. AMY CHUA - She is a professor at Yale Law School and lectures frequently on the effects of globalization to government, business, and academic groups around the world. YUJIRO HAYAMI - Born in 1932, was one of the first Japanese to earn a U.S. Ph.D. in agricultural economics after World War II (Iowa State, 1960). He began his professional career in the National Research Institute of Agricultural Economics in Japan, followed by two decades' service at the Tokyo Metropolitan University. He recently moved to Aoyama-Gakuin University. He has also served as visiting professor at the University of Minnesota and as an economist with the International Rice Research Institute in the Philippines. He served on the Editorial Council for the American Journal of Agricultural Economics in 1972-74 and 1984-86. DR. KONRAD NG - a University of Victoria- and McGill-educate Malaysian assistant professor at the University of Hawaii in Manoa (UHM) in the Academy for Creative Media at the University of Hawaii, whose family originally comes from Sabah. He is married to Obama’s half-sister Maya Kassandra Soetoro-Ng. Maya and Obama have the same mother. 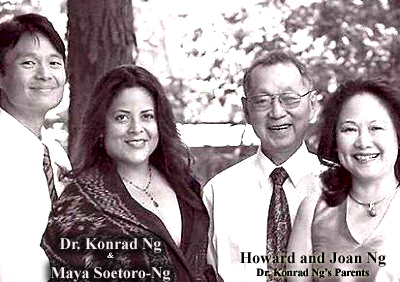 His father, Howard, was born in Sandakan and his mother, Joan, in Kudat. His parents subsequently settled in Canada (Burlington, Ontario) and Ng was born there. Maya was born to Lolo Soetoro, an Indonesian businessman, and Ann Dunham, a white American cultural anthropologist, who is also Obama’s mother. CHIURA OBATA - In 1932, he received a post as an art instructor at the renowned University of California, Berkeley.In 1942 Obata Chiura and his wife Haruko were among the more than 100,000 Japanese Americans who were moved from their homes at the West coast into ten relocation camps. During his internment in different camps, the artist made about hundred sketches and paintings until his release in 1945 that can be seen in the book Topaz Moon.During his confinement at Topaz in Utah, he organized an art school for the 8,000 Japanese Americans in Topaz. The Topaz Art School had over 600 students with 16 art instructors. After 1945, Obata Chiura could continue his former post as an art teacher at University of California at Berkley until his retirement in 1954. WILLIAM OUCHI - the Hawaii-born native, who comes from a family of teachers who felt stifled by out-of-touch bureaucrats, was a pivotal figure in the future of California public education and reform by bringing entrepreneurial methods to California’s 8,000 schools with Education Secretary Richard Riordan. He is the behind-the-scenes idea man who argues for turning principals into entrepreneurs while giving campuses new control over their budgets and prodding schools to compete for students. Ouchi serves as director of the School Design Project, a twelve-person interdisciplinary effort to study the organization and the management of urban schools, including those of New York City, Los Angeles, Chicago, Edmonton, Seattle, and Houston. He is Co-Chair of the Los Angeles County Alliance for Student Achievement, Chair of the Nozawa Endowment at the Anderson School, and Chair of the Riordan Programs. He is a former trustee of the Harvard-Westlake School and of the California Community Foundation, former chair of the Los Angeles Educational Alliance for Restructuring Now (LEARN), and a former member of the Consumer Advisory Committee of the U.S. Securities and Exchange Commission. He serves as Chair of the Finance Advisory Committee of the Los Angeles Unified School District and was a member of the Advisory Committee on Performance of the California State Department of Education and of the Advisory Committee on Budget, Finance and Technology of the LAUSD School Board. In many ways, China and the United States represent the yin and yang of international education. Whereas China's top-down system places supreme emphasis on tightly structured, disciplined learning, the United States has a highly decentralized system that places greater importance on critical thinking and "student-centered" learning. DR. CHANG-LIN TIEN - former chancellor and professor at UC Berkeley was a leading voice in Asian American politics while being a co-founder of 80-20. Under Tien's leadership, Berkeley was recently rated the top graduate school in the nation in nearly every subject among both public and private universities. A native of China with strong ties to Asian business leaders, Tien has attracted major donations to the University from Asia. Tien was born in Wuhan, China, and educated in Shanghai and Taiwan. JAN TING - professor of law who is an advocate for "alien rights." HIM MARK LAI - Him Mark Lai, the internationally noted scholar, writer, and "Dean of Chinese American History" was born on November 1, 1925 in San Francisco's Chinatown and died on May 23, 2009. His ten books, more than 100 essays, and research in English and Chinese on all aspects of Chinese American life are published and cited in the U.S., the Americas, China, Southeast Asia, and Australia. Almost every researcher or scholars of the Chinese American communities are indebted to his work. He gave Chinese Americans a voice in history by listening to ordinary people in the United States and China that allowed him to read and think in the Chinese language. He has created the Him Mark Lai Collection that contains his 4+ decade of bi-lingual research into four part - Research Files, Professional Activities, Writings and Personal Personal Papers. "His legacy challenges us to listen, to think and to feel more deeply - to untangle, to clarify, and to refine the historical and political record of our lives here." (Russell C. Leong).